This peaceful oceanfront condo is just steps from the whitest sand in San Diego, and only blocks from the heart of Ocean Beach's shopping district on Newport Avenue. It has two bedrooms and one bathroom; the Master with a King sized bed and a 26" flat screen television. The second bedroom is equipped with a full sized bed. This condo can comfortably accommodate up to four adults. 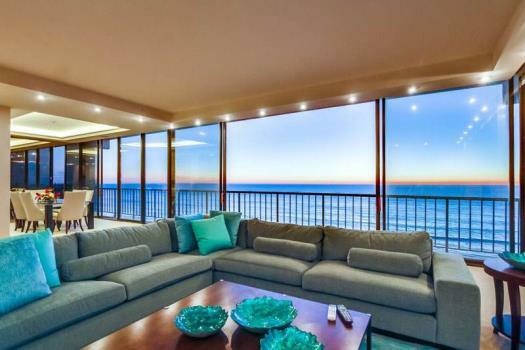 Brighton Shores offers picturesque ocean views, an open floor plan and expansive windows allowing for a constant flow from the fresh ocean breeze. Relax and take in the flair of Ocean Beach on Brighton Shore's private balconies. Within the condo, you will find a fully stocked kitchen, featuring a gas stove, dishwasher, microwave, all other basic appliances and practical beach-friendly tiles. 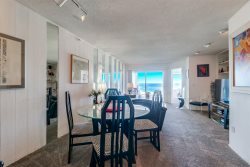 You will also find the light and bright living room equipped with a 40" smart flat screen television with a sliding doors that lead out to the private patio overlooking the beach. The coin-operated laundry is located on the first floor of the apartment building. This property is pet friendly (under 25 lbs), and within a short walk to the OB Dog Beach.